It’s late afternoon, halfway through a 12-hour-long rehearsal day forFinding Neverland, the musical version of the 2004 Johnny Depp movie about the playwright J.M. Barrie — creator, 111 years ago, of Peter Pan and the Lost Boys, which made his career and also inspired the 1953 Disney animated movie, the 1960 stage-to-screen version starring Mary Martin, the peanut-butter brand, the bus company, the solidly mediocre NBC live event starring Allison Williams last year, and Michael Jackson’s ranch (not to mention the so-called syndrome, which describes commitment-phobic arrested development). At the moment, Matthew Morrison, who plays Barrie, is stage right in the 1,505-seat Lunt-Fontanne Theatre, practicing his dance spins. 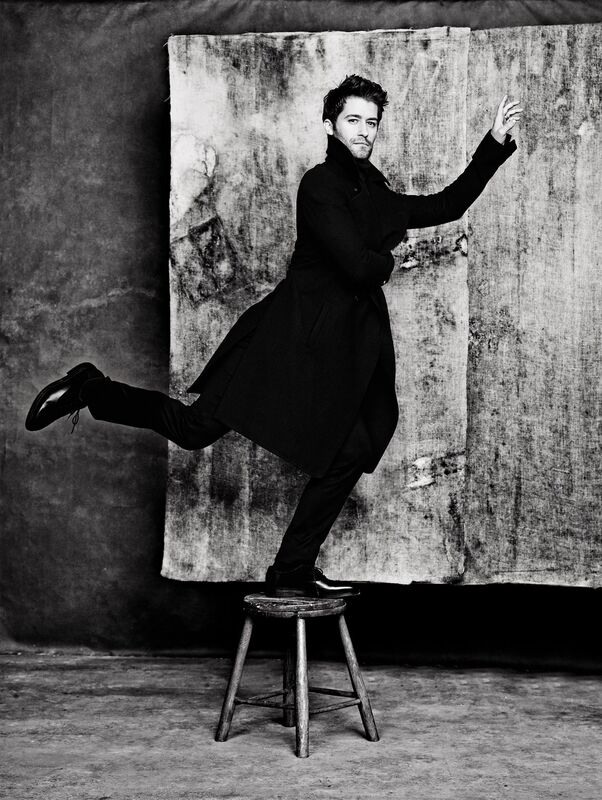 The previews of Finding Neverland are timed almost exactly to the wrap of Morrison’s six-year run as the earnestly encouraging Ohio high-school singing-club coach Will Schuester on Fox’s once-game-changing sing-along dramedy Glee.Morrison has traded his Mr. Schue sweater-vest for an Edwardian suit to play this dancing Barrie, whom Depp played with dreamy charm and sincerity, loitering on a park bench and not at all creepily gazing at frolicking boys while writing in his notebook. As we all wait for the scene to start, Morrison will lie down, then sit up on his knees, hands in his lap, in a sort of yogic meditation pose. There’s a lot of waiting around between takes during rehearsals. The real-life Barrie was, by all accounts, an unusual model for a Broadway leading man. His wife left him, saying they never consummated their marriage, and he practically stalked the cancer-stricken widow Sylvia Llewelyn Davies and her five “lost boys” after the death of their father in 1907. After her demise, in 1910, he became their guardian, paying for their educations at Eton and Oxford (one of the boys died young in World War I, and another later took his own life). But Finding Neverland is entertainment, not strict biography, and Morrison, 36, was hired for, among other attributes, his Glee-bred upright-sensitive-guy élan. Barrie was irresistible in part because it’s simply a big lead role, of the sort he was on the path to in his 20s right out of NYU’s Tisch school. He had starring roles in Hairspray, The Light in the Piazza (for which he was a Tony nominee for Best Featured Actor in a Musical at 26), and South Pacific. He was well on his way to becoming the sort of leading man Broadway hadn’t seen in quite a while. And then Glee sent him back to high school for six years. “I have this kind of underlying issue of unentitlement,” says Jane Lynch, his former Glee onscreen nemesis. “Matt is one of the most entitled people I’ve ever met, but in the most lovely way. He knows he’s got the goods, but he wears it lightly.” And Morrison is the sort of person who always seems like he has a plan (he tells me, “We’ve got our little timeline” about the possibility of him and his wife having kids, and says he makes enough money renting out the apartment he bought in Hell’s Kitchen in 2005, pre-Glee, that it “pretty much” pays the mortgage on his new condo). Lynch’s postmortem is similar. “It’s like emotional whiplash, my character,” she says. “I have that redemption scene with Matt: ‘I want to be your friend, I’m jealous of you.’ I had that scene six times.” In the end, it just became “confusing,” Morrison says. “They have so many things that we don’t even talk about. Sue having a child. We’re always like … I forget the baby’s name right now. Where’s Wanda, or whatever its name is?” Morrison also didn’t know the air date of the last episode off the top of his head. That rehearsal day, it’s time for a costume rendition of “Stronger,” in which Barrie, finally confronted with his own imaginatively timid, notebook-scribbling, cosseted sense of self, has a kind of psychic break and conjures Captain Hook — his swashbuckling id — for the first time. (A smoke machine is deployed for this.) But first Hook, played by a lustrously bewigged and hook-handed Kelsey Grammer (that day in running shoes), needs his fake mustache. Apparently it will help him get into pirate mode. The rehearsal for the number begins with Hook declaring that he’s a figment of Barrie’s “circus of the mind” (“I came from you …”), while his band of scalawags choreographically move a park bench around onstage and knock Morrison about until he — Barrie — is willing to accept the Hook-y side of himself. It ends, stirringly, with Barrie, now vestless, declaring: “I am stronger,” poised atop that bench that doubles in his imagination as a ship, sword aloft. As we all know, Glee is coming to an end. And just yesterday, the cast and crew gathered for their final day of shooting. Yes, their absolute last day of filming. Morrison had to rush from the set to get to the Montage to perform a number from his upcoming coming Broadway return, Finding Neverland (more on that later). See you on Broadway, Mr. Morrison. Watch the short video interview on E!Online. Glee: “Child Star” episode stills! Newly released HQ stills from episode 6.09 of Glee, “Child Star”, airing on Friday, February 27, at 9/8c on FOX. Newly released HQ still from episode 6.08, “Wedding”, airing on February 20, 2015 at 9/8c on FOX. View the UHQ picture here. Newly released HQ stills from episode 6×07 of Glee, “Transitioning”, airing on Friday, February 13 at 8/7c on FOX. Additional stills from the episode can be found in the gallery. One HQ still from episode 6×05, “The Hurt Locker, Part Two”, airing next Friday, January 30, at 8/7c on FOX. Matthew shoots Glee and rehearses for Finding Neverland! Matthew shares a picture from the set of Glee, where he’s shooting the show and rehearsing for his upcoming Broadway show, Finding Neverland! Glee Season 6 – new HQ promotional pictures! Newly released promotional pictures from the upcoming season 6 of Glee, premiering this Friday, January 9, at 8/7c on FOX. Glee – first new season 6 episode stills! First HQ episode stills for the upcoming sixth and final season of Glee, premiering on January 9, 2015 at 8/7c on FOX. Glee – Season 6 promotional picture! New UHQ promotional picture for the sixth and final season of Glee, premiering on January 9, 2015 at 8/7c on FOX. Click here for the UHQ picture. Matthew and fellow Glee cast members remind us where season 5 left off. Glee is back with a two-hour season premiere Jan 9/8c on FOX.